OUR AWARD-WINNING DOCUMENTARY FILM ABOUT RECONNECTING WITH NATURE AND LIVING WITH PURPOSE. Staring Down Fate is a documentary film about searching for purpose in life and in mortality; about finding inspiration in the face of uncertainty. It is a story about 7.4 billion people and our relationship with nature, told through one person's life - Chris Lucash, a red wolf biologist diagnosed with ALS. Scroll down to see our awards and to learn more about the documentary! Watch it streaming on your TV, phone or tablet using the FREE Vimeo app for AppleTV, Amazon FireTV, Android TV, Roku, Samsung TVs or Chromecast. Find out more about our World Premiere weekend in Michigan here. We are honored and ecstatic that Chris' story received the "Best Feature Film" award at the Sunrise 45 Film Festival and the prestigious "Atman Award for Diversity in Film" at the Southern States Indie FanFilmFest! A heartfelt thank you to the audiences! Winner "Atman Award for Diversity in Film"! Chris Lucash received the final verdict in June of 2015: He has a "terminal disease" - ALS (Amyotrophic Lateral Sclerosis, aka "Lou Gehrig's Disease"). ALS affects the nerve cells (motor neurons) responsible for movement such as walking, talking, chewing and more. It gets worse over time until a person is no longer able to breathe and swallow. Heartbroken and angry he starts his journey to find meaning in life and in dying. How does a person who depends so deeply on his physicality, working with wolves in the wild, deal with this debilitating disease? This is a transcendent story about a person searching for meaning in mortality, while watching the future of his life's work challenged and fall into doubt. "You get no choice or volition in how you are born, but you do in how you live your life and how you die." Staring Down Fate is a painfully heartwarming story about a man who dedicated himself to bringing red wolves back from extinction in the wild, but who's life takes a drastic turn when he is diagnosed with Amyotrophic Lateral Sclerosis (ALS, also known as Lou Gehrig's Disease). We join Chris on a personal and intimate journey to answer the question “Why me?” as he discovers new research showing correlations between environmental issues and neurodegenerative diseases (like ALS, Alzheimer's and Parkinson's Disease). But throughout this inspirational tragedy, Chris provides us with warm and light-hearted moments. We learn from him and his team working with red wolves in the wild and learn with him and his family as his health declines. Even with dying on the horizon, Chris finds meaning in the hope that his story will contribute to bringing people closer to nature and each other. He inspires us to find comfort and passion in living lives of purpose to continually make this world a better place. This film features unparalleled access to the red wolf recovery program over six years of filming and provides never-before-seen footage as Chris and his colleagues work with wild endangered red wolves. Chris spent 29 years on a team that reintroduced the endangered red wolf into the wild in northeastern North Carolina. In 1986 zero red wolves existed outside of captivity. The wild population grew to an estimated 110 to 130 individuals, but recently declined dramatically to fewer than 45 in the wild. The entire program in northeastern North Carolina is under review and potentially faces its demise. Chris stares down fate along with the red wolf, as they fight for their space and time. In Staring Down Fate we will experience Chris' work with red wolves, learn about the importance he places on humans connecting with nature, and witness the extreme physical effects of a disease correlated with many potential factors ranging from genetics to pollution. We will explore these potential causes of ALS, experience the struggle of knowing your life has changed and your days are numbered, and search for how to feel fulfilled even when your career work is in jeopardy of being cut. This film came about because Chris wanted his young children to see what he did in life and in his career. But the film progressed because it is about all of us: our relationship to nature, our search to find purpose in life and our struggle to find meaning in mortality. Most of us have had a loved one deal with imminent death and many know people with neurodegenerative diseases. 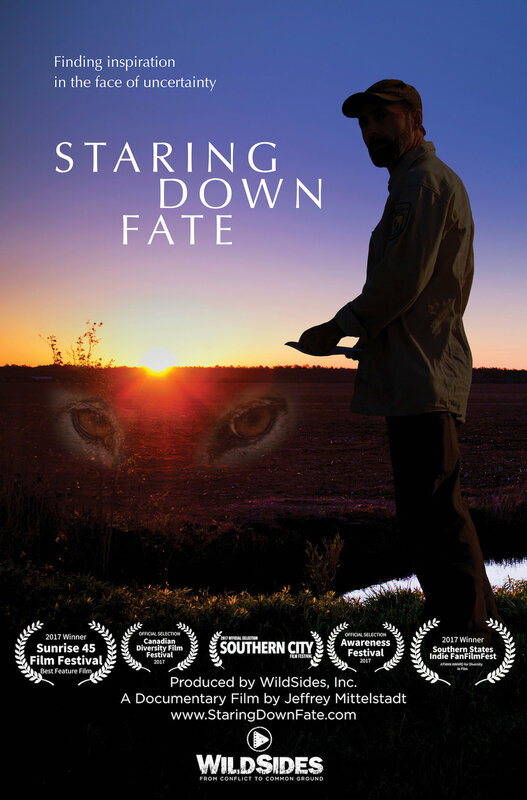 Staring Down Fate will serve to fulfill Chris' dream for more people to learn about the plight of the elusive red wolf and for his kids to learn about nature, wildlife and how their father spent his life. The depth of this story and dissemination of the film will further increase awareness of the correlations between environmental issues and neurodegenerative diseases, like ALS. It illustrates the need for more ALS research into causes and treatments. But most of all, it inspires all of us to live our lives with purpose to make this world a better place. First of all, we would like to thank everyone who contributed and supported this film in so many ways. This film happened because of you! The support of all of our families and friends through all of this cannot be quantified or explained. THANK YOU! We had over 260 financial supporters of this film! Thank you to every single one of you. Many are in the credits of the film, some are listed in the levels below, many more gave to support the effort and some were anonymous donors. Each and every donor was instrumental in the completion of Staring Down Fate. THANK YOU!